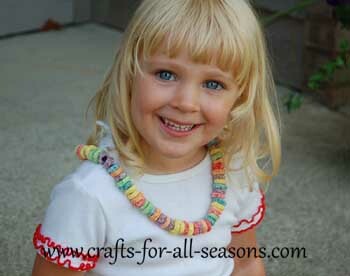 This cute fruit ring necklace will keep children amused to for quite awhile. My three year old daughter loves making these. 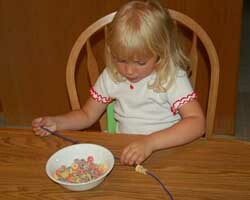 It helps children stay focused and learn hand/eye coordination, especially for preschoolers. 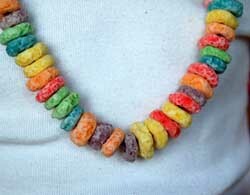 The necklace is made from yarn and fruit ring cereal pieces. When they wear it, it resembles a candy necklace, and they can bite off the pieces. 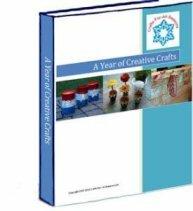 These are fun to make at birthday parties. Kids just love making them and wearing them! 1. Begin the necklace by cutting off a piece of yarn a little longer the length you want the finished necklace to be. Take a small piece of tape and wrap the one end of the yarn (like the end of a shoe lace), so it will be easy for your child to thread on. 2. 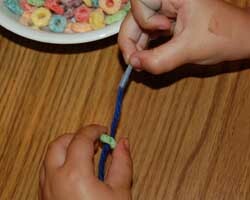 Have your child begin threading on the fruit rings! 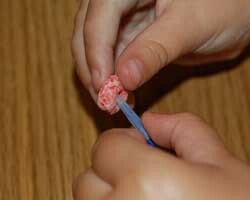 You can set them free to thread them on as they wish, or have them practice some color patterns. 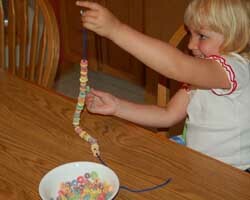 This kept my daughter busy for almost an hour! 3. When all the threading is complete, tie it around the child's neck. He or she will enjoy eating off all the rings!